If you plan to go in the water - and unless you have a narrow stream with tree-free banks (of which there are few) going in the water is the best way to access some of the best trout fishing. Without going in the water, many holes will be unreachable due to obstacles like trees, cliffs and thick vegetation. You could go in the water without hip boots or waders, but I don't recommend it. Remember, trout are most active when the water temperature is between 57 and 63 degrees. You will get very cold very quickly without something keeping the water away from your skin. In this defense against the cold, you have three options. Hip boots, booted waders or stockingfoot waders. I'll go from the least expensive to the most expensive and talk about some of the pros and cons of each. Hip Boots are basically wellies that come up to your hip. -Inexpensive; you can often find these for less than $30 on sale at Wal-Mart or other discount stores. -Built-in boot means no other accessories to buy. - Only hip-high, limiting the depth of water you can wade into. 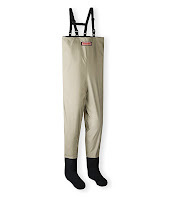 Booted waders can come in waist-high or chest-high varieties. They have the boots built in so you don't need to buy a pair of wading boots to wear over them. The price of booted waders are higher than hip boots, but not as much as stockingfoot waders. - One piece makes them easier to put on than hip boots and generally more comfortable to move around in. - Comes in waist-high or chest-high varieties, so you can get into deeper water than with hip boots. - Built-in boots mean no wading boots to buy. - Having the boot built-in means they are prone to leaks, just like hip boots. And difficult to patch. Stockingfoot waders are similar to cleated waders, except instead of having the boots built-in, the feet in them are like socks, so you'll also need a pair of wading boots to use them. - Usually chest-high so you can get into some fairly deep water. - Stocking feet means fewer seams and fewer leaks. Also, they are easier to turn inside-out than wading products with built-in boots if you need to work on patching them. - The most expensive of the three varieties. Especially since you need to buy a pair of wading boots to go with them. - Comfort. the stocking feet help keep your feet warmer and water pressure doesn't collapse the sides of your boots like the other varieties. If you are new to the sport, I suggest starting with hip boots or booted waders. You'll save some money and they will last for a few years, so if you lose interest you're not out much - but if you do decide to stick with it, they will last you a little while. I think the best value overall though is in stockingfoot waders. They will last much longer and are definitely the most comfortable of the three.